At Genacross Lutheran Services, our mission to serve is not limited to those people who walk through our doors. We actively reach out to the local communities in which we operate to engage with our neighbors, build relationships, and provide assistance in a variety of ways. Following are just a few examples, including ways you, too, can share in our mission. If your company, organization, school or church would like to partner with Genacross Lutheran Services Foundation, please contact us via email. All opportunities are evaluated based upon the mission of Genacross Lutheran Services. In east Toledo, First St. John Lutheran Church operates a personal needs pantry. This program provides necessary personal care items that cannot be purchased through state-funded supplemental food programs. In 2017, over 375 families were served by the pantry, the only service of its kind available to east Toledo and Oregon-area residents. 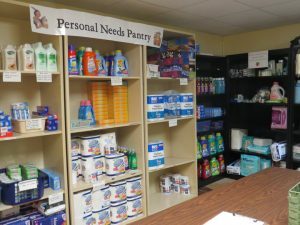 Genacross supports this program by providing previously unused space in the basement of our administrative offices building on Seaman Street to house the pantry. We were also able to make a financial contribution from our Mission Integration Special Fund to restock the pantry when its shelves were nearly bare. However, the monthly need consistently exceeds available support from First St. John and other local contributions. If you would like to donate to the pantry, please visit our Donate page on this website and designate your gift to benefit the Mission Integration Special Fund or the First St. John Pantry. A Firm Foundation for Life, a weekly radio program hosted by Rick and Jackie Metz, invites medical, psychological, spiritual, financial, and other professionals to address a variety of topics related to aging, and maintaining and improving the quality of life for older adults. The Genacross Lutheran Services Foundation, along with other community organizations, sponsors the program as a community service and as a way for listeners to learn more about the services offered by Genacross Lutheran Services. Presented for over 15 years, the program can be heard locally on Saturdays from 9-10 a.m. on News Radio 1370 WSPD and 92.9 FM, and the program is streamed live on the WSPD website. Original broadcast date: Aug. 11, 2018. Click here to listen. Original broadcast date: May 5, 2018. Click here to listen. Original broadcast date: Dec. 9, 2017. Click here to listen. Original broadcast date: May 13, 2017. Click here to listen. Genacross Lutheran Services Foundation partners with area schools to provide opportunities for students to serve in many of our communities. These programs not only benefit Genacross residents but also provide ways for students to engage with people of various generations, build self esteem, and live out their faith by serving others. If your school would like to partner with Genacross to offer a volunteer program for your students, please call us at 419.861.4964 . Thanks to a generous gift from Lawrence and Adele Youngbauer, the Genacross Lutheran Services Foundation is able to annually award scholarships to four students who will be continuing their educations in the fields of human services, medicine, ministry or education. One senior from each of the following schools, located in areas where the Genacross Lutheran Services ministry has a presence, will be awarded a scholarship: Anthony Wayne, Clay, and Liberty Center high schools and Cardinal Stritch Catholic High School & Academy. Interested students should contact their school guidance counselors for more information.